You’ve tried quick fixes. You’ve searched the Web for help. Still, your Mac is unhappy. It’s time to focus on finding the cause of your problem instead of just getting rid of the symptoms. When your computer is running smoothly, it’s a very good idea to set up a separate troubleshooting account using the Accounts preference pane. Leave this account untouched and unused until things start to go awry. For example, suppose you are having a problem where an application keeps crashing on launch. Log in to your troubleshooting account by selecting Log Out username from the Apple menu, and then selecting the account from your login screen. Launch the troublesome application. Does it launch successfully now? If so, you’ve discovered a critical piece of information. You now know that the cause of the crash is almost certainly some file within your Home directory—the folder that holds all the files for your usual user account. (Your Home directory is labeled with a house icon and your user name.) You can move on to the next troubleshooting step. On the other hand, if you use a different account and the crash still occurs, you’ve learned that the source of the problem is probably outside your Home directory. As you’ve presumably already tried reinstalling the application to no avail, the problem is most likely in the /System/Library or /Library folders—or perhaps one of the invisible Unix folders. Fixing problems like these outside your Home directory can be tricky. If you’re feeling intrepid, one of OS X’s troubleshooting utilities may be able to help (see “Five helpful troubleshooting utilities you already have”). For many people, though, a problem of this type merits a visit to the Genius Bar. If you’ve confirmed that the problem is within your Home directory, you may be able to fix things on your own. Here are several common sources of trouble and ways to deal with them. Root out corrupted preferences files To find the preferences file for an application, look in youruserfolder/Library/Preferences. Once you’ve opened this folder, press Command-F and then limit your search to this folder by clicking on Preferences in the Search bar. Type the name of your program in the Search field. Look for a file with a name in the format com.vendorname.programname.plist. For example, for iTunes you’ll see one named com.apple.iTunes.plist. If an application is behaving oddly, search for its preferences (.plist) file and remove it from the Preferences folder. This can provide an instant cure. Drag this file outside its folder and relaunch the application. If the crash disappears, congratulations—you’ve found the culprit. Delete the .plist file you removed. You may next need to redo any custom preferences you set up for the application. If the crash still occurs, return the apparently OK file to the Preferences folder. If additional .plist files include the name of the application (as is the case with iTunes), you can next try removing them. Dump corrupted cache files Go to the Cache folder in your Library folder. Again, check for folders or files with the name of the crashing application. Delete them. If you can launch the application, a faster way to accomplish this task is to use the Empty Cache command that’s built into some applications. For example, in Apple’s Safari, select Safari -> Empty Cache. Purge problematic plug-ins It’s possible that there’s a conflict between your crashing application and some third-party plug-in designed to work with it. For example, if you use Safari plug-ins, you’ll find them in youruserfolder/Library/ Internet Plug-ins. For Mail plug-ins, check youruserfolder/Library/Mail/Bundles. Remove plug-ins from their folder to see if this fixes the problem. If it does, check for updated versions of those plug-ins. Otherwise, determine which particular plug-in is the culprit and stop using it. Many programs (including iPhoto, iTunes, and Microsoft Entourage, to name just a few) depend on databases, sometimes called libraries. If a database becomes corrupted, rebuilding it can get the program up and running again. Rebuild the program’s database If your program uses a database or library, the problem may be a corrupted database. Many programs of this type offer a way to rebuild the database. 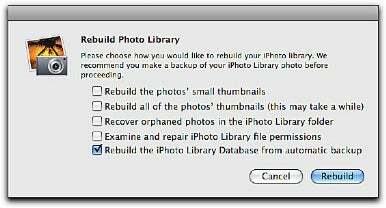 For instance, with iPhoto, hold down the Command-Option keys when launching and select Rebuild The iPhoto Library Database From Automatic Backup in the dialog box that appears. If any of the other rebuild options seem relevant to your symptoms, check these as well. Similarly, hold down the Option key when you launch Microsoft Entourage to access the Database Utility. For iTunes, it’s a bit more complicated; see this Apple article for details. For other programs, search the help info or read the documentation to find out whether a simple database-rebuilding procedure exists. Check your login items If your Mac is crashing at the end of the startup procedure while the desktop is loading, one of your login items may be to blame. Open the Accounts preference pane, select an account, and click on Login Items to see the list. The easiest way to deal with login item problems is to install Marcel Bresink’s free TinkerTool ( ). Using it, you can easily deactivate and reactivate login items (see “Check login items”). If you log out and back in after each deactivation, you’ll eventually determine which, if any, login item is the source of your trouble. If your problems appear during or immediately after logging in, a login item may be the culprit. To find out, use TinkerTool to deactivate each item in turn and see if any of them is the source of trouble. Fix your keychain If programs inexplicably reject your passwords or you’re having a problem that seems to be password related, launch Keychain Access (/Applications/Utilities). From the Keychain Access menu, select Keychain First Aid and try to repair the Keychain.